Let's be real, as moms we are busy and we tend to put ourselves last. We know we need to see the doctor but ... we are so busy taking care of everybody else that we don't have time to take care of ourselves. I am HORRIBLE about it. 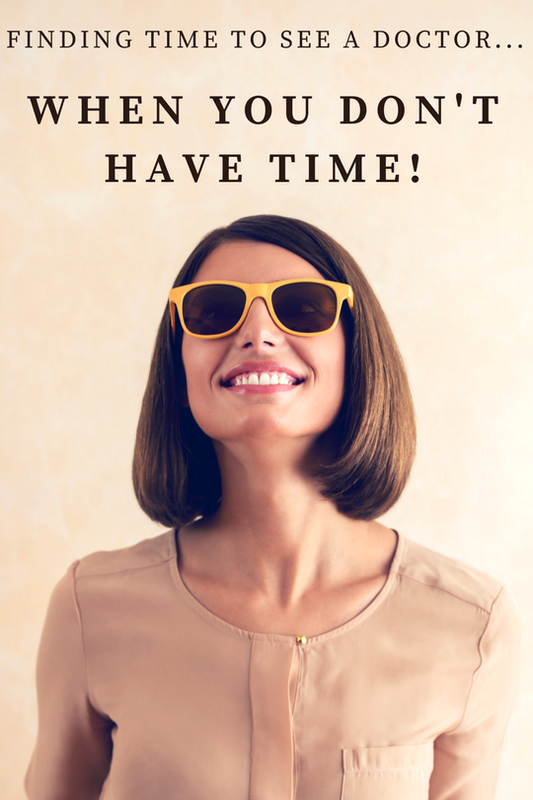 I *know* I need to get in for a visit but honestly, between my work hours, my daughter's needs, and working on my blog (and other side businesses), I just don't have time to schedule for myself like I need to. I love my primary care doctor but his hours are the same hours as mine and no Saturdays. I know better- I work in healthcare! But I use up all my sick time for my daughter's specialist appointments. Not feeling well? Single parent or the only one at home? Don't want to drag your kid(s) out to go to an urgent care? Me, either. Well, there is an option that will help simplify lives. At least it's done that for me! Samsung Health's Ask an Expert is a sanity saver. 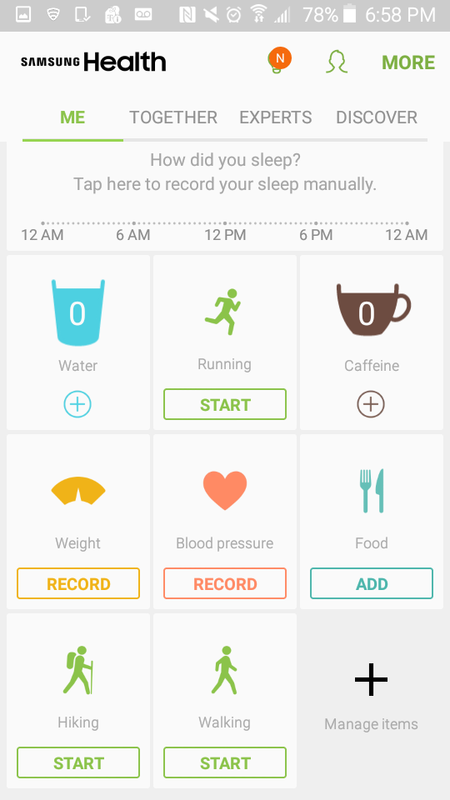 Samsung Health is already a very cool app (Use it, trust me!). Your health in your hands. Samsung Health tracks your activity, nutrition, and sleep, and delivers insights based on your progress. Set your health goals, track your activity, get insights based on your lifestyle, stay motivated, and keep your health information secure. 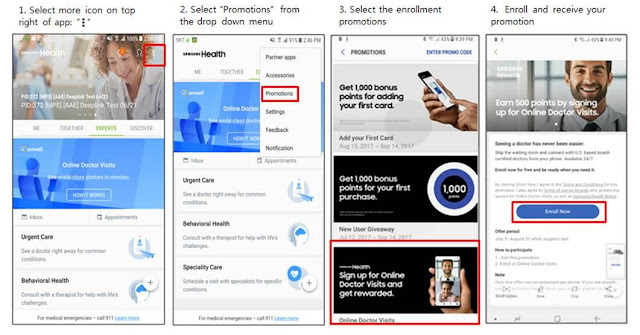 Samsung Health is already built into your Samsung phone – no download required! Samsung Health tracks your biometric data and syncs with many partner apps such as MyFitnessPal, Garmin, and MapMyRun to gather more information about your health. See a doctor online via your Samsung device - there’s no easier way to see a doctor! See a board-certified doctor in just minutes – no appointments needed. We’re available for you 24/7. Online doctor consultations are covered by many top health plans. You can even get a prescription, if needed, sent to your local pharmacy. Share the biometric data you’ve tracked in Samsung Health directly with the doctor you see online. Ask an Expert currently offers urgent care services only. In October, they will be launching specialty services such as nutrition and therapy services, by appointment. What if I’m not sick? Flu season is already here! See a doctor and get expert medical advice on how you can prevent your family from getting sick this flu season. Why Should I Use Ask an Expert? Ask an Expert is built into Samsung Health, which comes preloaded on your Samsung device. No download required! Pulse (bpm) - The pulse is the measure of the heart rate, which is the number of times the heart beats per minute. The pulse rate may go up or down depending on various factors, including exercise, illness, injury, and emotion. A normal resting pulse rate for healthy adults is between 60 and 100 beats per minute. SpO2 - The pulse-ox measures the percentage of oxygen in the blood. The percent of oxygen in the blood can go down if a person is not breathing well, such as during an asthma attack or when they have pneumonia. It also might be low if a person has a disease such as congestive heart failure. Blood Pressure - Blood pressure is the force of the blood pushing against the artery walls. Blood pressure can vary depending on exercise, illness, injury, and emotion. However, consistently high blood pressure is called hypertension and is related to a higher risk of heart attack or stroke. Weight (self-reported) - Weight is an important measure to understand the general health of adults or children. Any unintended rapid weight loss or weight gain is a sign of a potential illness. Glucose (self-reported) - Glucose is the amount of sugar in the blood. Normally the body can regulate sugar in the blood appropriately, however, in times of illness, blood sugar can become dangerously high or low. Also, patients who have conditions like diabetes need their blood sugar closely monitored to ensure that they are at normal levels. 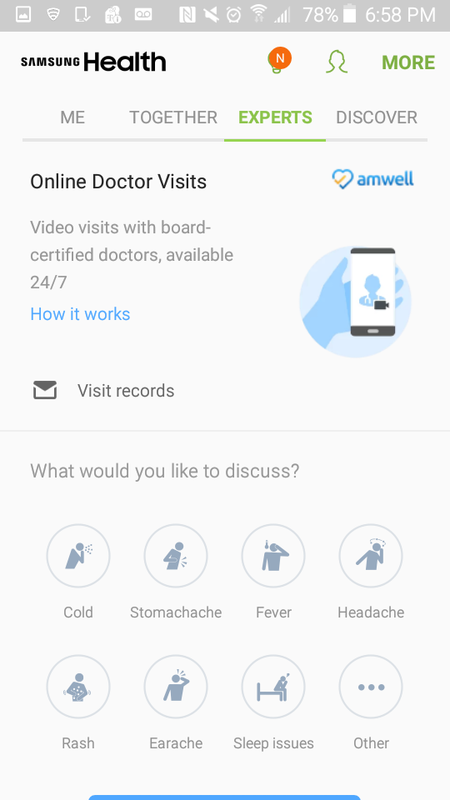 My experience with "Ask An Expert"
I have ALWAYS wanted to use Amwell's service and I was really excited to use it via Samsung Health's Ask An Expert. This also couldn't come at a better time because I have been having sinus issues that I know has brewed into a sinus infection. This isn't my first rodeo but I just can't take enough time off to go a doctor's appointment so I figured- let's use Ask an Expert for this annoying sinus issue. The app is EASY to use. Sign into your Samsung Account from the Samsung Health App and then click on "Experts". Select your health concern (if listed, if not- select other). Complete your information- name, DOB, pharmacy, insurance, health history, etc. You also set up payment- the visit is $59 (no insurance) and could be up to $99, depending on the reason for the visit but the amount is disclosed upfront. A list of doctors comes up - you have the option to choose one of the doctors listed or select First Available. What I like is that you can read the doctor's details, a blurb, and their credentials. Also- RATINGS! Honestly, I was a bit concerned about seeing a doctor remotely. I'm a bit old school but my concerns went away quickly. The doctor was incredibly thorough. We discussed my medical history, my medications, my biometric data, and more. We discussed options on how to alleviate some of the symptoms. I did request a prescription for an asthma medication that I took that was great for me in the past and she obliged based on my history and symptoms and also sent a prescription for sinus medication (ugh, VERTIGO!). I have zero complaints and I will absolutely use this service again. 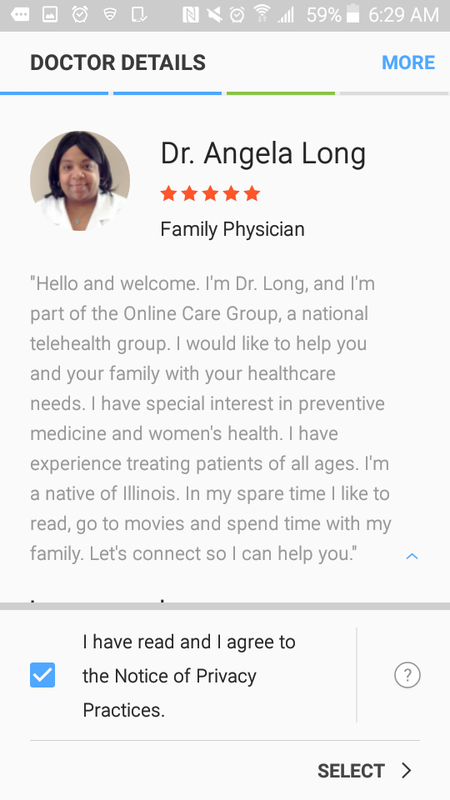 The doctor was amazing, the convenience of just opening up an app on my phone and connecting is worth its weight in gold and again, the entire service was great. Doctors are available 24/7! I am already planning to use it again soon because I am dealing with high blood pressure. My sister passed away in May and her autopsy results came back that her cause of death (at the age of 46) was from uncontrolled high blood pressure. Yeah, I will be returning to Samsung Health Ask an Expert very soon to discuss controlling my blood pressure and how to can get it back to a healthy level before I do damage. Are you interested in trying Samsung Health's Ask an Expert? Be sure to use this special promo code JUST for readers of my blog. Have you tried any kind of telehealth service before? What did you think of it?